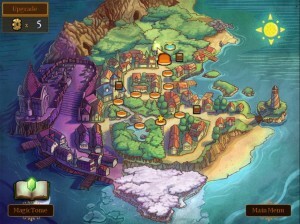 The unlikely heroine of indie developer Endless Fluff’s Legend of Fae is Claudia Bernard, a young girl who was born with a disease that leaves her weak in the legs. As a result she needs to walk with a stick to keep her balance. As if that wasn’t enough, her busy parents have sent her off overseas to live on Sea Cross Island with her uncle rather than raising her themselves. Oh well – Uncle seems rather more caring than her parents, and also happens to be a master of mechanical crafts. With his guidance, Claudia learns much about mechanical engineering. Until one morning when she wakes up to find he’s disappeared, leaving behind only a a lantern, book, and a note telling her to get off the island! Of course instead of heeding his advice to escape, she decides to set off and find him instead, and in the process learns of the “Fae”. These elemental fairy-type creatures, invisible to most people, have the ability to give Claudia special powers which help her in her quest to find her Uncle’s whereabouts. 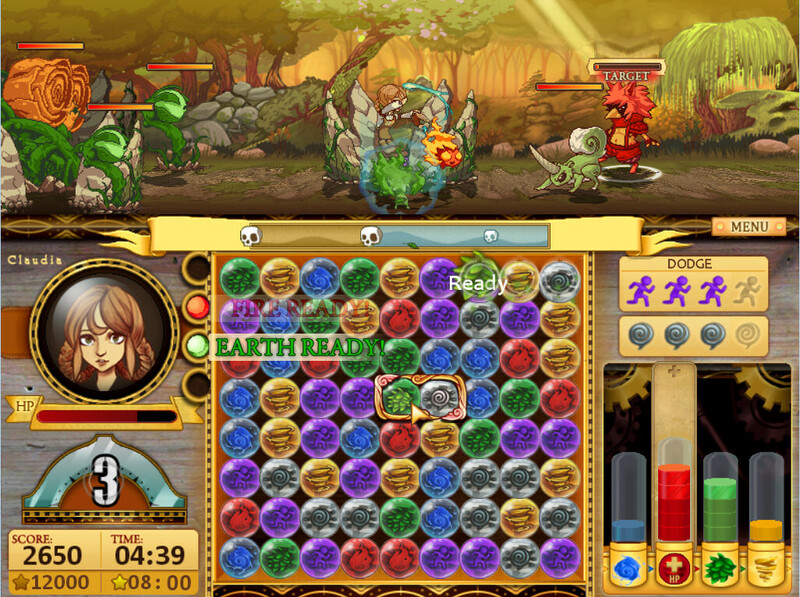 Legend of Fae is a match-3 type puzzle game, which is split into two distinct sections; gathering mode and attack mode, although these occur concurrently. 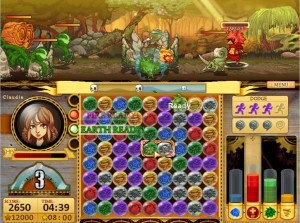 At the bottom of the screen, you’re able to match gems to earn abilities and spells, as well as block and defend against opponents’ attack. In the top section, the real action takes place, with Claudia facing off against enemies and the obstacles they throw at her. Once you have gathered enough elemental power you get a little Fae of that elemental type floating next to you, and you’re able to click on it to make an attack with it. While you’re gathering though, you’ll be attacked by your enemies too so you need to make sure you keep an eye on both areas of the screen as well as your health bar. I did find it very slightly irksome that these components are quite separate, in that you need to click on the opposing area to activate it before you’re able to take action; I felt it could have been more smoothly integrated, but it’s a relatively small niggle and didn’t really detract from the gameplay. The combination of these two different gameplay elements makes for fast moving and absorbing action, and will keep you thinking rather than mindlessly clicking – as can sometimes end up being the case in such games. Do that in Legend of Fae at your peril! There are four elemental powers that you can gather – earth, wind, fire and water – and each enemy is also based on an element. Each element is particularly powerful against another specific element, and you can score critical hits if you use the correct elemental attack against the enemies (also scoring more points); for example using water against a fire elemental will score you a critical hit. There are also flying elementals which must be blown down to the ground with wind before you’re able to attack them. This definitely adds an extra level of depth to the game as sometimes the specific element you’re after will be in short supply, particularly later in the game. As well as all that, when you match elements during the portions of the game between fights, you can activate them on yourself for additional buffs – so it’s worth trying to load up on a few of these before you match too many purple movement gems. In the combat field other gems also come into play – for example the purple gems which will progress the story when you’re not in combat allow Claudia to block attacks when you are. There are also grey mind gems which can be matched to ward off status hampering attacks like blindness and poison. On top of that, there is a chain combo system which makes your attacks more powerful as you make more and more matches in a row, so trying to ensure there is always another matching move available becomes a strategic necessity. So quite quickly you’ll come to realise there’s actually tons to think about in this deceptively simple looking puzzler. And that’s not all! Remember the lantern which Claudia found when her uncle disappeared? 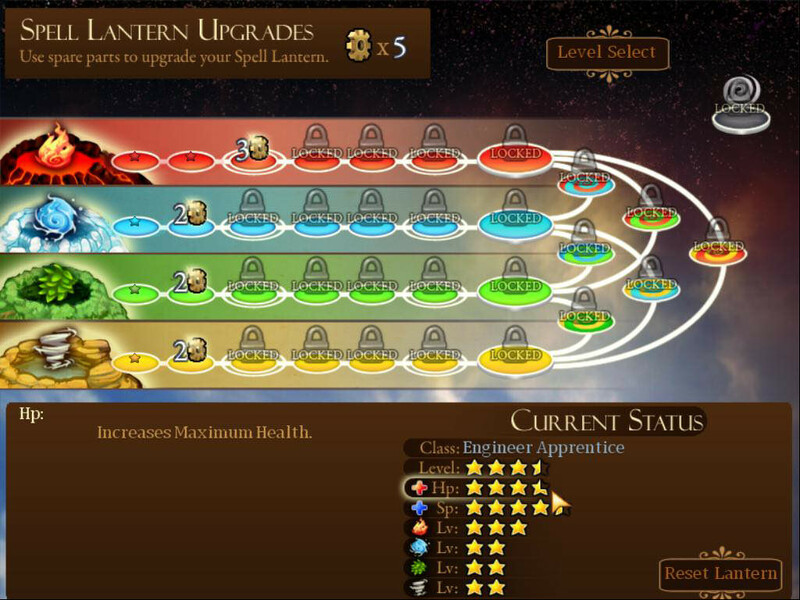 As you fight monsters, you’ll find collectable items which can be used to upgrade your lantern – which basically determines your character build. 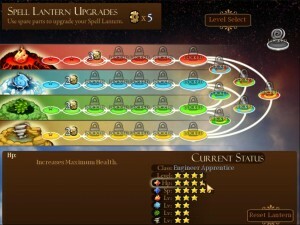 You’re able to put points in each element, unlocking more powerful spells and abilities in the process. It’s not possible to max out your stats here, so you need to think carefully about how you want to develop Claudia’s abilities as you go through the 50+ levels that Legend of Fae has to offer. Once you’ve completed the many levels, you can also go back and try for expert status which involves getting a certain score within a certain time frame. Not an easy task, although as you gain experience with the later levels, the earlier ones will be much easier to achieve expert on. To sum up, the production value of the boyfriend/girlfriend duo’s first game is very good; the bright pixel art is fitting with the gameplay and the music is well produced. Overall, I was impressed with the surprising depth that this puzzler offers and would definitely recommend it to anyone who is a fan of the genre! This looks sort of charming and sort of weird at the same time. Definitely an interesting puzzler though.